As I was unable to locate the chosen cheese for this week's tasting, I chose instead a similar aged goat's cheese from Spain. Monte Enebro is made in Avila, Spain, by cheesemaker Rafael Baez and his daughter Paloma. It is made using the same mold as Roquefort, and indeed this lovely cheese has a slightly 'Blue Cheese' finish. 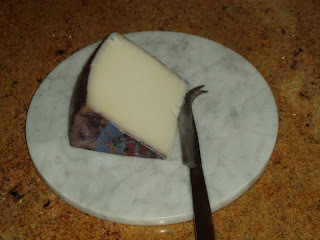 Monte Enebro is producted in central Spain, near Madrid, while the Quesos de Murcia are traditionally produced in the south east. This cheese had a lovely creamy, almost tacky texture, and an mild moldy flavour that was really delicious. I only regret that I couldn't sample the Drunken Goat, although I am not going to give up the search yet. The drunken goat is an elusive cheese beast –too complex for my immature palette. Both an animal and country switch from our last tasting, this fromage adds the vino factor, which I found distracting. The cheese seems friendly enough on the surface, but I always found myself looking for hints of wine: sometimes finding them and sometimes not. One of the reasons I like cheese is its moldy / bitter component, which d. goat lacked. It starts with a creamy taste / texture with only slight hints of mold, but in the finish you get a strange sugary sweetness. Don’t get me wrong, fellow cheese lovers, this cheese is certainly delicious – just not the right cheese for my love affair to continue. I sent this one packing. Obviously these are the words of child – to reject this cheese so harshly. Perhaps it’s best to say: D. goat, I will revisit you! Despite my overly judgmental sampling, my purchasing experience was exquisite. I’ve discovered a cheese boutique mere blocks from my residence. Refrigerated cases lined with fromage. You can sample before you buy. And they seem to not take themselves too seriously. Also, I’m pleased to report that they recommend the Jenkins book.